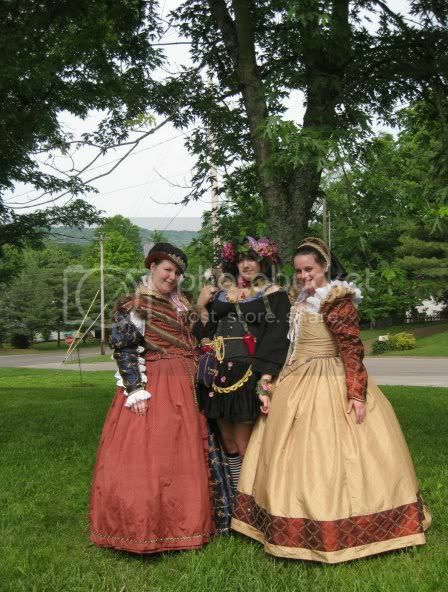 I wanted to share two gowns I made this past year for the 2009 (and most likely part of 2010) renfaire season. I actually made these back in April but I just haven't really had the time to post images anywhere until now. These dresses are steadily getting looser on my friend and I as we loose weight so we're hoping to get as much use out of them as we can. My dress is the Rust and Blue, and my friend Amber's is the Gold and Scarlet. Neither one are 100% historically accurate, but rather, Historically inspired in an effort to use stash. I think the only thing I purchased for this was thread, some buckram, and some feathers for my hat. 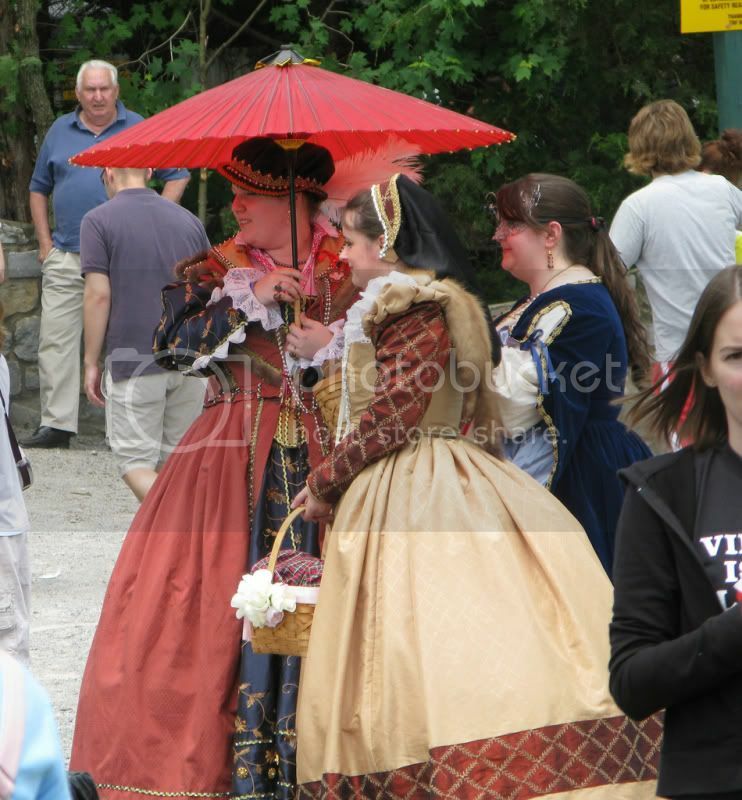 These dresses were originally made for the Georgia Renfaire season (where we live) but we decided to travel to some out of state faires and have had a fantastic time. The two that these pictures are from are the Kentucky Highlands Renaissance Faire, and the Tennessee Renaissance Faire, both of which are beyond awesome and we highly recommend. I have wanted a doublet style gown for a long, long time and I've had a pair of 1930's mink coat collars that, while having fallen apart quite a while ago, were still in good enough shape to be re purposed. I'm a huge huge fan of recycling at all costs. I was gifted these by a friend and I couldn't just see throwing them out, especially since they're about 70 years older than me. I cut them into strips and used them as part of the trimming on my gown. The sleeves are tie-on, and the whole thing is worn over a corset, bumroll, petticoat, hoopskirt (store bought, I haven't made an H/A hoop yet, but I like that the hoop I have now gives me a nice shape and washes out fine after faire is over). The redwork partlet I'm wearing in some of the pictures I embroidered entirely by hand. I love it so much and it's my favorite piece in the costume. The rust fabric was given to me, and the blue silk I got at a home decor fabric mart in Atlanta in the remnant bin for $2.30 a yard. There are about 3,000 glass and plastic pearls sewn to the dress, though most of these pictures were taken prior to their attachment. Amber's dress is Venitian inspired. The gold fabric was given to me by the same person who gave me the rust for my dress, and the scarlet embroidered came from the same interior decor shop clearance table. We picked this dress style for a few reasons. First, it's easier for her to get into herself. 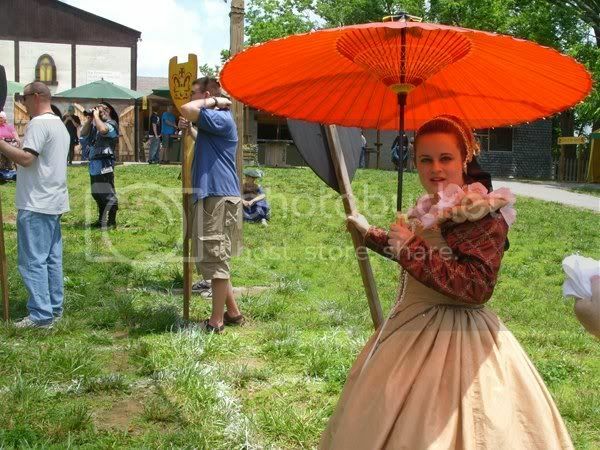 Secondly, it looks less like what you see a lot of at Faire. The bodice is boned for stability, but it still wrinkles at this point because of her having lost weight and the dress not fitting like it should anymore. 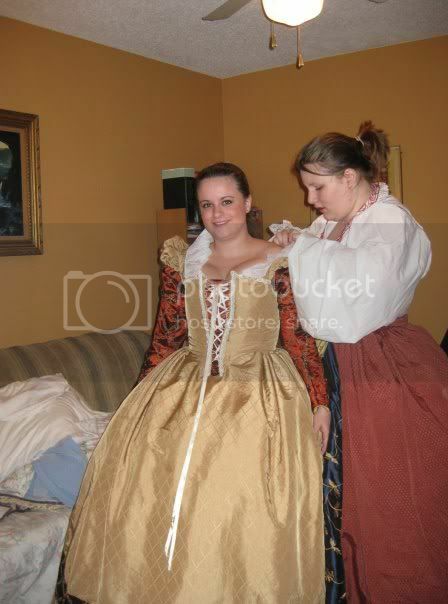 The ruff is hand sewn to the collar and all detail work, beads and trim, including the French Hood, were done by Amber. 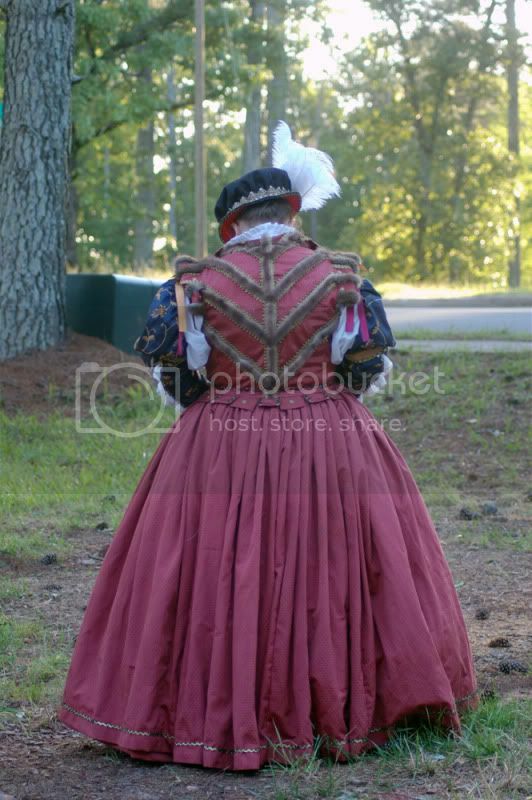 She wears her dress over a corset, bumroll, and hoopskirt. Edited to add: Both my bodice and Amber's were constructed from Simplicity pattern 3782, but I altered both of them so much for fit and style that they're really not like the original pattern anymore. 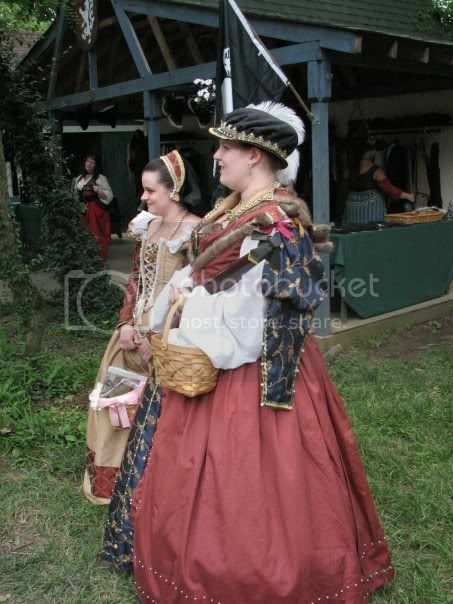 The skirts, sleeves, and accessories were made either by self draft or from various costuming pattern books (Period Costume for Stage and Screen, The Tudor Tailor, Patterns of Fashion, etc). The two of us with a friend before we headed out to the Tennessee renfaire for the day. 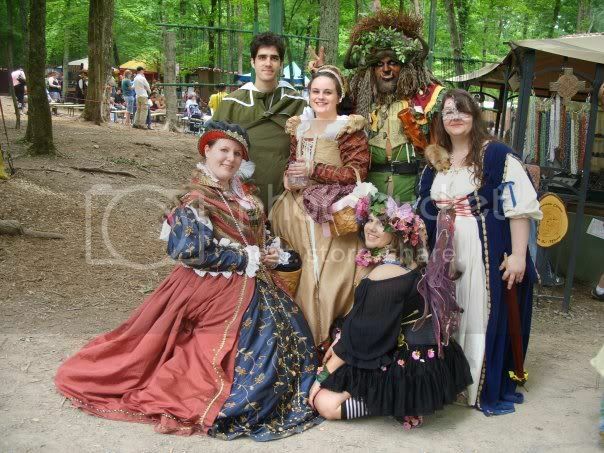 Amber and myself with several friends, including Ik, King of the Trolls who is just a plain out awesome guy. We loves him so very much! Oh MY gosh! 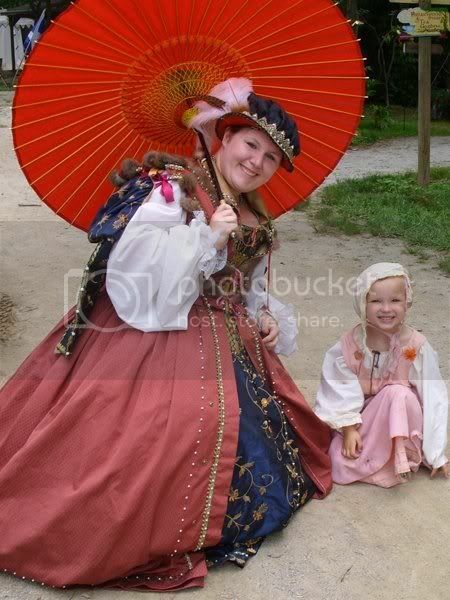 You put all other renfaire dresses i've seen to shame!! Nice dresses!! I wish i can sew. Fabulous work... the detail on each is incredible. The last photo showing the back of your dress is so beautiful. I'm in awe! Beautiful! It's so nice seeing someone not doing the "wench look"! These are beautiful! and gorgeous on you girls...nice work. I wonder if they have events like that up here in the Northwest? I would so love to go and maybe get involved! I wonder if they have events like that up here in the Northwest? I would so love to go and maybe get involved! Thank you so much everyone for your compliments!! Sunflower Smiles: Go to www.renaissancefestival.com, they have a listing of just about every Renaissance festival - large and small - in the country. Most states have one or two : ) If you've never been to one, they are a lot of fun. Hawkeye: We do get hot, yes, but I make costumes for a living and do a lot of historical reenactment and competitions at conventions so I'm used to big heavy garments. It's all about taking precautions. If it's too hot I leave the sleeves to just hang, and leave off certain accesssories. Drinking lots and lots of water is a must and taking breaks in the shade is helpful. I carry a parasol with me and lots of women who frequent faires have "Bodice Chillers" which is this nifty little metal tube you fill with water, freeze and then insert into your bodice between your "ladies" (I like to put mine between my chemise and my corset to keep it from burning my skin) and it will keep your core cool. 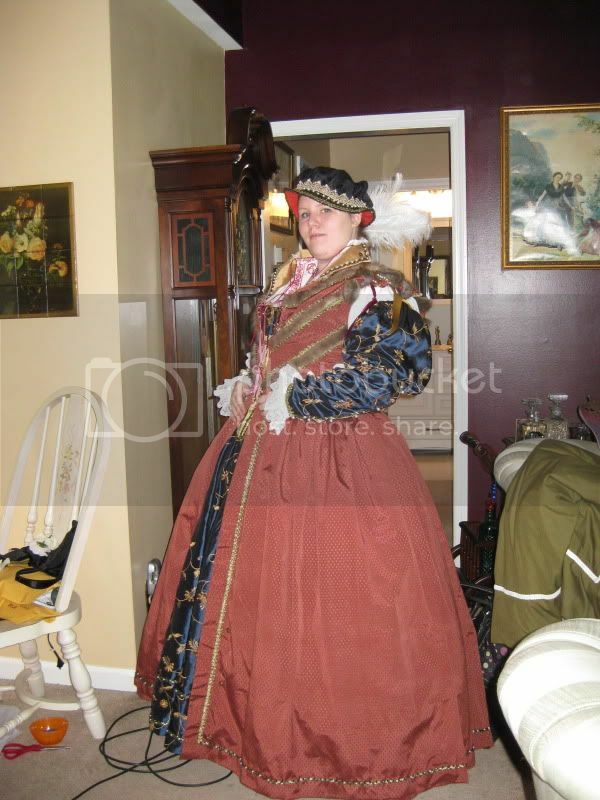 Hoop skirts are a huge huge help, if you sway back and forth they create an updraft, kind of like built in A/C. 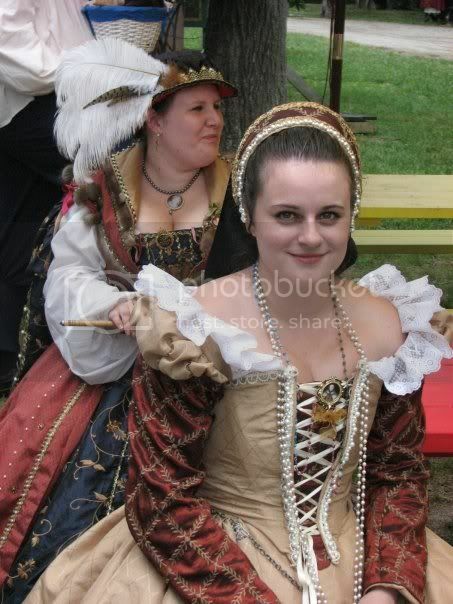 If you're ever at faire and you see ladies doing the "Renfaire Sway," that's what it's for. I play a variety of characters depending on what Faire I'm at. In the super hot months I prefer to do things like Fairies or Medieval gowns which don't involve so many layers. I will say this though, Atlanta's season starts in Mid April and it's still fairly cool out by that point. It doesn't start getting really hot until mid to late May. 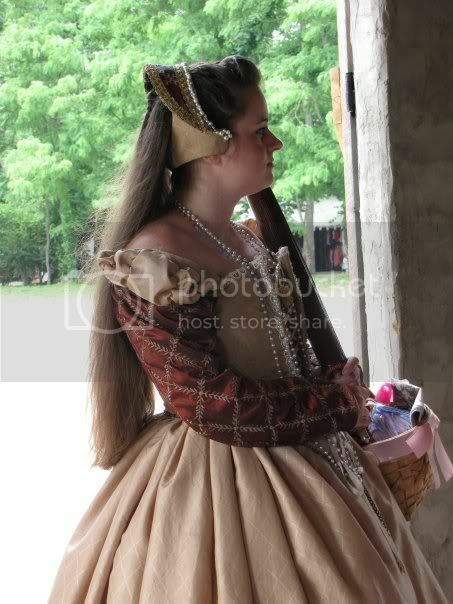 I'm gonna be a wench, or a reconned RenFaire outfit!